Allan Bussard has worked in missions in association with the Navigators in Central and Eastern Europe since 1975. He has worked in student ministry in the former Yugoslavia, pioneered the Navigator ministry in the former Soviet Union and for almost 10 years was the Navigator Regional Director for Central and Eastern Europe. 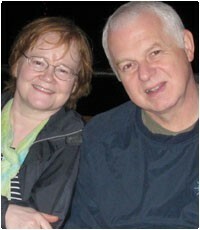 In 1981, Allan and Caulene have worked together in a range of ministries in Central and Eastern Europe. Since 1991, Allan and Caulene have lived in Bratislava, Slovakia. In 1995, he co-founded Integra, which is an economic development agency with ministries in Slovakia, Romania, Croatia, Serbia, Romania, Bulgaria, Russia, Kenya Ethiopia and Sudan. Integra focuses on enterprise solutions to poverty, with investment, consulting and training engagements in the areas of microenterprise development for women at risk, Social Enterprise development for disadvantaged groups, Corporate Social Responsibility advocacy and training, anti-corruption advocacy, awareness and training, Fair Trade and youth employment and enterprise creation. Since 2003, Allan has led the development of Integra activities in East Africa, with work in CSR, fair trade market access for at risk clients and a joint microenterprise development project in South Sudan in partnership with EPTF, World Concern, World Relief and Stromme Foundation. Integra is a partner agency with the Integral Alliance, the European Federation of Ethical Banks, the International Association of Investors in the Social Economy, the European Microfinance Network and the Micah Network. He is a co-author of, “Corporate Social Responsibility: Overview of Basic Principles and Practices”, which is an introduction of CSR to the Central European market, as well as numerous articles in the area of microenterprise development and poverty alleviation strategies. Allan is currently leading a project for Integra staff and clients called, “UpStream” , in partnership with Regent College (Vancouver) and the Schloss Mittersill Study Centre. UpStream is a 3-year program aimed at helping Integra staff build and implement a Biblical mind and world view about issues of economic development, poverty alleviation and spiritual transformation in an economic development context. Allan lives and works out of Integra’s head office in Bratislava, where he lives with his wife and three children. Search by last name or ministry location.